Yatra offers a variety of travel products such as flight bookings domestic and international, domestic and international holiday packages at best prices. Yatra deals let you enjoy huge savings on your trip. Yatra provides tempting offers for users. Currently, new customers can get a discount of Rs.2500 on flights.Like Yatra, MakeMyTrip also giving discounts on flight tickets. To grab those discounts check MakeMyTrip Flight Offers and save more. Register on Yatra website and login your account using the details provided to your email ID. Choose to make a flight booking. Give the details like departure and destination places, date of travel, one way or round trip, the return date for round trip booking and the number of travelers. Click on the search button to get the list of available options. Select the option of your choice and make the booking. Give the Yatra domestic flight coupon code DELIGHT to avail the discount of Rs.2500 on round trip booking. A discount of Rs.1250 can be availed on one-way booking. The discount amount will be credited to your Yatra account in the form of eCash within a week of making the confirmed booking. Yatra domestic flight offer is available only for new users.You can find discount deals for domestic flights in Goibibo also, they are giving various offres on domestic flight tickets. The eCash obtained as promotional eCash can be used to make the flight, hotel and bus bookings. The eCash obtained through this flight offer is valid only for 90 days. The customer can redeem the eCash only after the travel date. This Yatra new user offer has to be used in single without combining with other offers at Yatra. Travel agents cannot use the offer to make the flight bookings. The eCash cannot be withdrawn from your account as cash. If the customer cancels the flight booking, the discount amount credited to the Yatra account as eCash will be forfeited. Yatra is currently offering super saving flight offers for new users. 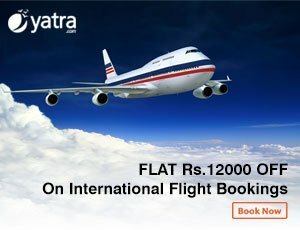 Yatra new customers can get a discount of Rs.12000 on international flights. If you’re still searching for more offers on International flights, then check Cleartrip Internatinal Flight Coupons and get more discount. Create a Yatra account by registering on Yatra website providing the required details. Login to your account with the details sent to your email ID. Choose to make an international flight booking. Choose the departure location as India. Give other details like destination location, date of travel, a number of travelers, the preferred airline, the class and the return date for round trip booking. Click on the search button to know the available options. Pick the option of your comfort and make the booking. Give the Yatra promo code DELIGHT to avail the offer. Customers who make their booking from Yatra app can get Rs.12000 eCash and those using the desktop app can get a discount of 11500 eCash. The offer is valid only on bookings for which the departure location is India. The offer is not valid on IndiGo, SpiceJet, Air Asia, Malindo, Air Arabia, Air India Express and Fly Dubai airlines. The minimum booking value has to be Rs. 30000 to avail the offer. The offer cannot be used with other promotional offers available on Yatra. Travel agents cannot use the offer. The eCash obtained through this offer is valid only for 90 days. The eCash can be redeemed only after the travel date. Only 5% of total flight booking amount, 20% of hotel booking amount and 10% of bus booking amount can be paid with eCash. If the customer cancels the booking, the discount amount will be retrieved by Yatra. The eCash cannot be withdrawn. Yatra guarantees to offer a low price on hotel bookings. 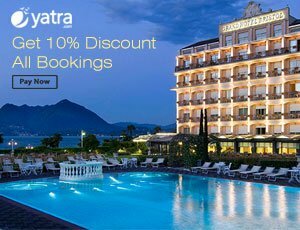 Yatra customers can get a free stay at hotels listed on Yatra using the 50% instant discount and 80% eCash offer on hotel bookings. Login to your Yatra account. Choose to make a hotel booking. Give the details such as place, the number of nights, check-in and check-out dates and the number of rooms required. Click on the search button to know the availability of hotels as per your requirements. Choose the hotel of your choice and make the booking. Give the Yatra hotel promo code REPUBLIC or HTDEAL or HTSTAR to get the discount. You can get these type of discount deals in Oyo Rooms also for hotels bookings. So before you booking check those offers also. Make the payment. The discount amount will be credited as eCash to your Yatra account. The maximum amount of cashback that can be obtained is limited to Rs.4000. The minimum booking value of 3000 is required to use the HTDEAL Yatra promotion code. Each customer can use the offer twice. The eCash amount will be credited to your Yatra account within one week of successful completion of the transaction. The eCash has to be redeemed within three months of receiving the amount in your account. The eCash can be used to make the hotel, flight and bus bookings. Travel for free by booking your bus ticket with Yatra. Customers can get 100% cashback on bus booking by booking their bus ticket using Yatra Android app or Yatra Windows app. If you are new to Yatra, download the Yatra Android or Windows app. Register on Yatra. Open the app and choose to make bus booking. Give details such as departure and destination places, date of travel, the number of seats required and the date return journey if you are making the booking for round trip. Click on the search button to know the availability of buses as per your requirement. Choose the bus of your choice and make the booking. 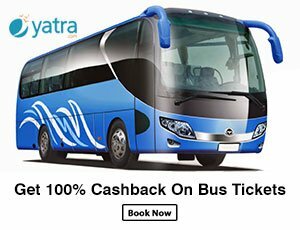 Give the Yatra promo code for bus APPBUS100 to get the 100% cashback offer. Make the payment. The cashback amount of up to Rs.3000 will be credited to your Yatra account as eCash instantly after processing of the transaction.Like Yatra, RedBus also offering discounts and cashbacks on bus tickets. So, you can check those RedBus Coupons also to get more discount. Yatra bus coupons are valid only on transactions made using the Android or Windows app. The maximum amount of eCash that can be obtained is limited to Rs.3000. The offer is valid only on routes that are available at Yatra. The eCash obtained by using the Yatra coupons for thebus have to be redeemed within three months of receiving the credit. The offer is valid only once per customer. If the customer cancels the bus booking Yatra discount given at the time of booking will be reverted. Yatra makes its services available through the mobile application, website, and the mobile-optimized WAP site. Customers can use the services of Yatra anytime 24×7. Yatra app is available to download for free. The app exclusive Yatra booking offers enable customers to enjoy great discounts on their travel bookings whenever they use the app for making the booking. The Yatra first booking offer provided for the new users is a great way to encourage users into using the Yatra services. Browse this site to know more details about Yatra welcome offer. Yatra.com provides exclusive deals for its mobile app customers. You can get up to Rs.10000 off on international flight bookings on Yatra app. If you are new to Yatra download the Yatra mobile app. The App is free to download for Google Play Store, App Store and Windows. Install the app and register at Yatra.com to start using your Yatra account. Choose to make an international booking. Give the required details such as destination and departure locations, travel date, the number of tickets, class, one way or round trip and other details. Click on the search option to get the available options. Choose the flight of your choice and make the booking. Give the coupon code YTMINT to avail the discount on your international flight booking. Make the payment. The cashback amount will be credited to your Yatra account in the form of eCash that can be used on your future transactions at Yatra.com. The offer is valid only on international flight bookings. Each user can use the offer only once. The offer is not valid on selected airlines – SpiceJet, Air Asia, IndiGo, Air Arabia, Air India Express, Malindo and Fly Dubai. Pros: Get More Discount Offers On App Bookings Compared to Web. Yatra.com provides multiple payment options for its customers. It ensures that all online payments are made safe. In collaboration with Visa, Yatra is offering heavy discounts on the flight, hotel and bus bookings. Login to your Yatra account. Choose to make the flight, hotel or bus bookings. Make the booking. Give the Yatra offer code YTVISA15 to avail the discount offer. Choose to make payment using VISA card. The cashback amount will be credited to your account as eCash. Visa customers can get eCash of Rs.350 to Rs.900 on domestic flight bookings. A discount of Rs.1500 can be obtained on international flight bookings. Hotel bookings can be made at a discount of up to 20%. A discount of 8% of up to Rs.200 can be obtained on bus bookings. The offer is valid only on payments made using VISA card. A minimum booking amount of Rs.6000 is required to avail the offer on domestic flight bookings. Minimum booking amount of Rs.30,000 has to be made to redeem the offer on international flights. No minimum booking amount is required to avail the offer on hotel bookings. A minimum booking amount of Rs.1000 is required to avail the offer on bus bookings. Customers canceling the booking cannot avail the offer. Travel agents cannot use the offer. The offer is valid only on online bookings made through the app or at the website. Yatra is offering a flat 10% discount on all travel bookings made using Standard Chartered Platinum Card. Customers of Standard Chartered Yatra Platinum card can also get extra reward points whenever they make payments using the card. Open the Yatra app. Choose to make travel bookings of your choice, bus, train, flight or hotel bookings. Choose to make payment using the Standard Chartered Yatra platinum card to avail the discount. You can get 10% cashback on the base booking value. A maximum of Rs.250 is offered on domestic travel bookings and Rs.750 on international travel bookings. 10% or a maximum of Rs.1000 discount can be obtained on hotel bookings. Each user can use the offer 12 times in a year and up to four times in a month. Customers of Standard Chartered Yatra Platinum card can also obtain reward points on money spent. 2 reward points can be earned for every Rs.100 spent except on fuel payments. 4 reward points will be given for every Rs.100 spent on Yatra. The reward points can be redeemed at Yatra.com while making the travel bookings. The cashback amount will be credited to your account within 30 days of the processing the transaction. The cashback amount will not be provided if the customer cancels the booking. Cancellation fee has to be paid by the customer upon cancellation of the booking except for domestic flight bookings. The customer has to make the booking in a single payment to avail the cashback offers. Split payments are not eligible for the offer. Yatra collaborates with some of the popular banks to make payments easy for its customers. Yatra is offering great discounts on travel bookings for HDFC bank customers.Open your Yatra account. Choose to make the flight, hotel, bus, or vacation package of your choice. Give the required travel details to complete the transaction. Give the Yatra HDFC promo code YAHDFC to avail the Yatra HDFC discount offers. Choose to make payment using HDFC credit or debit card or net banking. Customers can get a discount of Rs.400 on one-way domestic flight booking, Rs.1500 discount on international flight booking, 25% discount of up to Rs.1500 on hotel booking, 15% discount of up to Rs.200 on bus booking, Rs.2000 discount on flight+hotel booking, Rs.1000 off on domestic holiday packages and Rs. 1500 off on international holiday bookings. The offers are available only for HDFC bank customers. The minimum booking value if any has to be made to avail the offer. The customer will not be given the discount upon cancellation of the booking. The discount amount will be credited to the Yatra account in the form of eCash instantly after processing of the transaction. The eCash obtained through the offer has to be used within 90 days of receiving the credit. The offer is not valid on selected airlines and selected hotels. 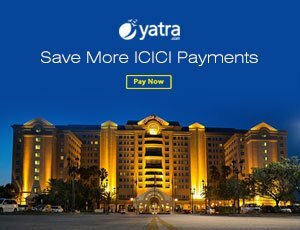 Yatra is providing exciting discount offers for ICICI Bank customers. Just choose to make payment using your ICICI credit/debit card to avail the discount offers. Open your Yatra account. Choose the product you wish to purchase at Yatra.com. Give the coupon code YTICICI2015 to avail the discount. Choose to make the payment using your ICICI credit or debit card or net banking. ICICI Bank customers are given a discount of Rs.400 to Rs.800 on domestic flight bookings, Rs.1500 off on international flight bookings, Rs.200 off on bus bookings, Rs.1500 off on domestic hotel bookings, Rs.1000 off on domestic holiday bookings, Rs.1500 off on international holiday bookings and Rs.2000 off on flight+hotel bookings. The minimum booking amount if any has to be made to avail the discount. The discount amount will be credited to Yatra account instantly as eCash. The eCash amount can be used for future transactions at Yatra.com. The eCash obtained with this offer has a validity of three months from the date of processing the transaction. The discount amount will be forfeited if the customer cancels the booking. Get your Yatra SBI credit card and enjoy huge savings on your hotel, bus or flight bookings. Customers registering for the Yatra SBI credit card can get Yatra vouchers worth Rs.8250. Login to your Yatra account. Apply for the Yatra SBI credit card. You will be given Yatra SBI coupons in various denominations after registering with the travel card. 2 vouchers worth Rs.500 valid on domestic travel, 2 vouchers valued Rs.1000 for use on international travel, 1 voucher worth Rs.750 valid on hotel bookings, 1 voucher valued Rs.1500 valid on domestic hotels, and one voucher worth Rs.3000 that can be used on international holidays. You can also earn reward points when you start using the credit card. Reward points will be added to your account every time you use the card. 6x points will be given for using the card at Yatra.com, grocery, and departmental stores. 6x bonus points on thebase amount spent at Yatra.com, 1 point for every 100 rupees used at other retail stores. All the reward points can be redeemed at Yatra.com. Yatra SBI credit card customers can also enjoy other benefits. You will be given discount voucher valued Rs.500 on every spending of Rs.30000 on Yatra.com. No fuel surcharge on fuel purchase valued Rs.500 to Rs.3000. Yatra SBI credit card holder can also use the premium MasterCard airport lounges within India. No Yatra SBI promo code is required to avail the benefits. Yatra is offering attractive discounts on travel bookings made using the Axis Bank cards. The offer can be availed on the hotel, flight, bus, flight+hotel, holiday packages and also other products being offered at the Yatra website.Open Your Yatra account or the Yatra open on your smartphone device. Choose to make travel booking of your choice. Give the required details and make the booking choosing the flight or bus or hotel or holiday package of your choice. Give the Yatra discount code YAXIS15 to avail the discount offers. Make the payment using your Axis Bank debit/credit card or net banking. Customers can get a discount of Rs. 400 to Rs.800 on domestic flight booking, Rs.1500 on international flight booking, Rs. 1500 or 25% off on domestic hotel bookings, Rs.2000 off on flight+hotel bookings, 15% or Rs.200 off on bus bookings. The eCash will be credited to your Yatra account within one week of processing the transaction. The offer is valid only on transactions made using the Axis Bank card. The eCash earned from this Yatra Axis Bank offer has a validity of 365 days from the travel date. The eCash can be used for hotel, flight or bus bookings at Yatra.com. The eCash will be forfeited if the customer cancels the booking. Pros: You Can Pay Bills Using Multiple Options Like Debit & Credit Cards and Wallets Payments to Get Discounts. Yatra offers a variety of travel products such as hotel bookings, flight bookings domestic and international, domestic bus and rail bookings, domestic and international holiday packages at best prices. Yatra deals let you enjoy huge savings on your trip. Few super saving offers even let you travel for free in a bus or enjoy a free stay at the hotel. It collaborates with about 50,176 hotels within India and 500,000 international hotels across the globe. The company reported great progress by offering top notch customer service, best price and by ensuring maximum availability of customer choices. Yatra corporate services make business travel easier and cheaper. Apart from online payments using credit or debit cards, Yatra also provides the facility to make payments using the third party payment gateways such as Mobikwik and Paytm. Yatra is offering huge discounts on wallet payments made using the Mobikwik wallet. Open your Yatra mobile app. Choose to make travel booking of your choice. Make the booking value of Rs.4000 or above to be eligible for the offer. No coupon code is required to avail the offer. Choose to make payment using your Mobikwik wallet. Make the payment. The cashback amount of Rs.300 will be credited to your Yatra account instantly after processing of the transaction. The minimum booking amount has to Rs.4000 to avail the offer. The maximum amount of cashback that can be obtained per transaction is limited to Rs.300. The offer is valid only Yatra Android and Yatra iOS app. This offer cannot be clubbed with other promotional offers available at Yatra. The discount will be deducted from the refund amount if the customer cancels the booking. Gift your loved one a memorable travel experience by presenting them the Yatra gift voucher. Gift cards can be personalized as per your choice to best suit the occasion. A personal message of 150 words can be included along with the card. The card will be sent to the given email Id instantly after purchasing. The minimum denomination of the gift card that can be purchased is Rs.1000 and up to a maximum of Rs.50000. Customers can choose the denomination of their choice from the available denominations. The gift vouchers have a validity of one year. They can be used to make purchases at Yatra.com – flight, hotel, bus, or rail bookings. The voucher can be used only once by the customer. The customer has to provide the unique voucher code at the time of making the payment to redeem the gift vouchers. The gift vouchers are cumulative. Customers cannot use the voucher along with any of the other promotional offers available at Yatra.com. If the booking value made by the customer is less than the card value, then the balance amount will be forfeited. If the booking value is more than the gift card value, the balance amount has to be to be paid using the credit/debit card or cash or using another gift card if available. Yatra.com the online travel service provider was launched in August 2006. The company operates with Gurgaon as its headquarters. Yatra grew tremendously since its debut into the Indian market overcoming the tough competition from its competitors. The company is honored with awards for its dedicated customer service. Yatra provides domestic hotel, bus, train, flight and holiday package bookings. It also offers international flight and holiday package bookings. Yatra offers and Yatra discount coupons are a great way to save on your travel bookings. It is known for offering best customer service and high availability 24×7. Yatra latest offers can be obtained from the offers section of the website. Customers can access the Yatra services online at the website or by using the mobile app. It also launched mobile-optimized WAP site for the convenience of the smartphone users. It is not just booking, cancellation and obtaining refund amount is also easy at Yatra.com. Customers can call the customer service to cancel the bookings and can make a request for the refund of the booking amount. Yatra gift voucher available in various denominations is the best gift that can be presented to your loved one on special occasions. Use of Yatra services is simple, easy, and cheaper. Yatra.com headquartered in Gurgaon, Haryana was started in August 2006. This travel website is one of the best online travel service providers in India. It has won awards for its outstanding performance as a domestic tour operator. The company has grown extensively since its launch acquiring three companies The Travel Services International, Global distribution system Provider MagicRoom.in and BuzzInTown.in, an Indian events and entertainment portal. It is also part of Travelguru.com. Nice Coupons..! I Got Rs.3000 Discount On International Flight Booking Using YINTSALE Coupon.